The McCain Brand Challenge is back on Chickadvisor! 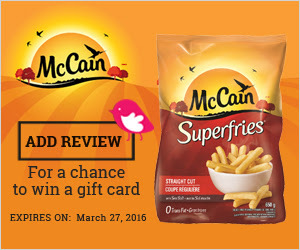 Review your favourite McCain Superfries products that you've already tried and earn bonus points, a McCain badge and the chance to win 1 of 5 $25 gift cards. Contest consists of four game pages and ends May 22, 2016. A new contest page will be launched every 5 weeks. This contest page is valid through March 27, 2016.